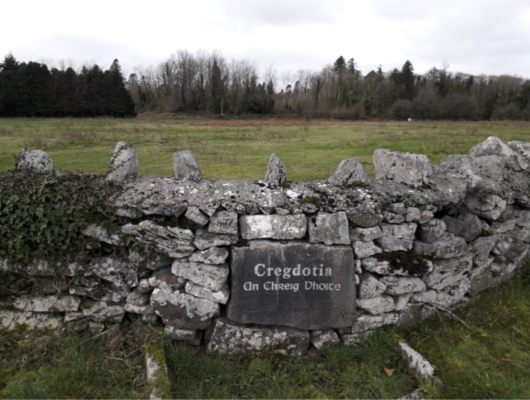 According to O Donovan’s Field Name Books 1838, the standard name given to the townland was Cregdotia and Creag Dóithte was its official Irish name. Other names given to this townland were Cregdothia (Boundary Surveyors Sketch Map), Cregdhoty (County Cess Collector, Rev. Michael Waldron), Cregdhoathy (Local), Cregdoatia (Meresman) and Cregdoty (Tithe Ledger). Cregdotia is located on the East side of this parish. It is bounded on the north by Gurtnaclossagh (sic.) and Breandrim. It was bounded west by Breandrim and Tubberrogue. It was bounded south by Tubberrogue and Cloonnamorriv. Bounded east by Cloonamorriv and Cregaree. The Down Survey was a cadastral survey of Ireland carried out by William Petty, English scientist in 1655 and 1656.The survey was apparently called the “Down Survey” by Petty because the results were set down in maps; ‘admeasurement down’ was used; it is referred to by that name in Petty’s will”. (Wikipedia). There was no information available for this townland in the Down Survey. The proprietor for Cregdotia was Lord Oranmore , Castlemountgaret (sic. ), Co. Mayo or London. The agent for this townland was Jerrard Strickland, Esq. Loughglynn, Co. Roscommon. Farms ranged from 2 to 4 acres. This village was held under lease by Robert Brown Esq. Portarlington and was sublet to tenants. The rent was 12 ½ shillings per acre. The Co. Cess paid 11 ¾ d. per acre for 14 acres. The soil was all rocky. O’ Donovan’s Field Name Books (1838) state ‘The very name of this townland tells that it is craggy’. Cregdotia produced light crops of wheat and potatoes. This village also produced some oats. There were no antiques in this village. According to Griffiths Valuation, this townland comprised of 45 acres, 2 roods and 36 perches. The total valuation for this townland was £12.0s.0d. Benjamin L. Guinness was the immediate lessor for this townland. 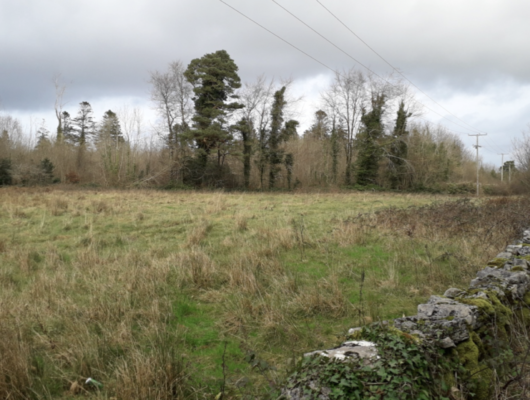 This townland was divided into two plots. Plot 1 was composed of 25 acres, 2 roods and 14 perches. This plot belonged to Thomas Kearney. Total valuation for this plot was £7.0s.0d. Plot 1 Thomas Kearneyhad a house, office and land. The land was valued at £6.10s.0d. and the buildings were valued at £0.10s.0d. Total valuation for this plot was £7.0s.0d. Plot 2 was comprised of 20 acres, 0 roods and 22 perches. This plot belonged to William Gallagher. Total valuation for this plot was £5.0s.0d. Plot 2 William Gallagherhad a house, offices and land. The land was valued at £3.10s.0d. and the buildings were valued at £1.10s.0d. Total valuation for this plot was £5.0s.0d. The 1901 census states there were two houses in this village and one of them was inhabited. The house that was not inhabited was owned by Lord Ardilaun. This house had no outhouses or farm steadings. There were three males in this village and they were all Roman Catholic. There was one piggery and one barn in this village according to the Return of Out-houses and Farm-Steadings (Form B2). Thomas Kearney(78) resided in house numbered 1 with his son and grandson. His son was Thomas(36) and his grandson was Michael(3). Thomas (Snr.) was a farmer and Thomas was a labourer. Thomas (Jnr.) could read and write, the rest of the household could not read or write. Everyone in this household spoke Irish and English. Everyone in this household was born in Galway. They lived in a 3rdclass house with three rooms. They had a piggery and a barn.